I am a bloodhound for pen lists. I can’t get my fill of innovative pen concepts. Yet it’s always a bit of a let-down to find out that these pen concepts are just pens on paper. The RGB pen that samples colors from the environment will sadly just remain a concept (and not a real, useable pen) if only for the fact that RGB describes monitor color. A real-world application would require CMYK inks that mix on command. Could you fit all of those ink cartridges in a tiny pen body? Probably not affordable. In recent months, I’ve grown tired of the pen-technology hybrids that promise the moon and don’t deliver a good writing experience (Wacom Inkling, I am so disappointed with you!). I’ve returned to the basics: a cool pen is one that has the look, the styling, and the track record as a good writer. And rather than hunger after pens that are yet to market, these pens are available *now* or will be in the next few months. Without further ado, here are my current picks for Cool Pens. Jean-Pierre Lepine is a French pen maker who makes pens by hand in a small workshop. He and his team make pens that are based on surprising textures, materials, and forms. The Graphyscaf, made in honor of Jules Verne and other underwater explorers, is hand-riveted together from 195 different parts. The Free Ride is a motorcycle-inspired pen that looks road-ready. Despite the slickness of his limited edition pens (the Cybergraph looks like a single piece of metal), Lepine’s designs are full of whimsy. He likes squiggles, rounded ends, and strange juxtapositions of form & function (what else would you call a prickly cactus-inspired pen?). You really have to see some of his creations to be believed. Lepine is a mainstay of pen lists, but finding his pens might be a little bit harder. Lepines are generally small-run creations compared to other manufacturers, if not outright limited editions. The Graphyscaf is the dream of most pen collectors only. In the last six months, there has been an explosion of pen-makers who successfully fund projects through Kickstarter. Their pet projects have been mouth-watering. These pen-makers are mostly making slick metal pen casings for the Pilot High-Tec-C (an incredibly popular disposable pen with artists and technical illustrators alike). The technical styling of these pens is an aesthetic that is mostly overlooked by traditional pen makers. Even while the pens aren’t overtly trying to target the high-tech crowd, pens like the Clip ‘en FLEX (a pen and a clip in one!) are clearly banking on buyers who are more interested in utility and usefulness rather than the executive splendor of a luxury pen. Browsing through these offerings brings fantastic ideas to life–like the Pen Type-A that features a slick aluminum body and a ruler that slides over the body of the pen. One of the most recent offerings is the P1 by Premier Pen. With a run-away funding of over 80,000 dollars for their start-up pen, Premier Pen will doubtlessly be bringing other prototypes to market soon. It’s true that I am biased towards the technical side of pens–I love a pen that reminds me of racing, cars, and industrial machines. But who couldn’t love the bright colors of Acme–or their incredible sense of play? Take the Acme #2. It looks exactly like the Number 2 yellow pencils that I grew up taking tests with. Right down to its attachable pink eraser nub (chew marks will have to be provided by the customer). Acme specializes in pens that reproduce art (the Mondrian inspired pen), cultural icons (Beatles Pens), or philosophical heavyweights (Homer from the Simpsons). While most of Acme’s pens are cool simply because of their playful patterns, I think the Acme #2 is one of the most clever pen concepts in the past ten years. Krone pens are stunning. They are some of the most gorgeous pens I’ve laid eyes on. Their limited editions are like miniature paintings. Under the glass, the K-Class limited editions shine like emeralds. So why does a fairly conservative pen manufacturer like Krone make the “cool pen” list? While I’ve been taking swipes at the normal stylings of luxury fountain pens in this column, Krone pens really are too beautiful to be believed. If you can see one in person, you’ll know what I mean: deep, rich lacquers that catch the light; subtle underlays that catch the eye; the best quality silvers, golds, and gemstones. That is to say, any pen manufacturer that is studding a pen with jewels can’t be considered a “normal” pen company. And their price tag matches that quality. Be warned: a Krone is not for a first-time buyer or the faint of heart. But that K-Class pen. Boy. I’d keep mine in a jewelry box. Now that’s a very cool pen. Whimsical Award: Any pen that’s studded with jewels. Go on, take a look! When you think of collecting, pens are probably not the first thing that comes to mind. In fact, you, like most people are more prone to losing pens than to collecting them. But we’re not just talking about pens you steal from the bank or borrow from a friend during class. We’re talking about Krone Pens. These fountain pens each have their own limited edition theme, from one embedded with Abraham Lincoln’s DNA to ones containing actual T-Rex bones. 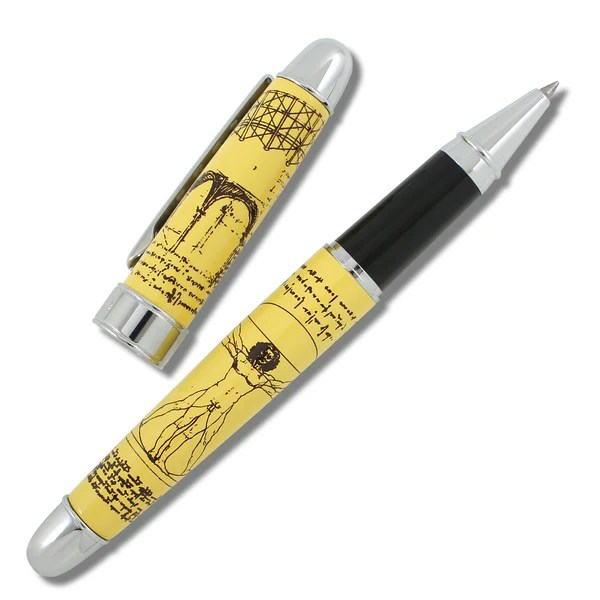 Every edition of their iconic pen is connected to a piece of history, making them great presents for writers or history buffs alike, or great in the collection of a Civil War enthusiast, all the way to the marine biologist. Because whether you or one of your loved ones is the collector, they have a pen that will fit into that collection. These are not just intended to be pieces of history, they are intended to be statements. They should mean something special to the owner, outside of simply being a writing implement. Their motto is, after all, “A Krone Pen is more than just a pen.” The president of the company, Robert Kronenberg, himself is a collector of vintage pens and the documents written with these important pens. This is pretty obvious in the pens he designs. Because so much design and theory work go into each and every single pen, it can take up to two years from inception to manufacture. It is obvious that a lot of work goes into these pens. Components of each pen are outsourced to the best metal workers, jewelers, carvers, and painters so that the finished and assembled product is the best possible pen. But just because they are meticulously crafted and constructed does not mean that they cannot be used on a day-to-day basis. Because the pens you pick for your collection are an expression of you, they need to be used in order to truly make use of their unique styling. What good is a Winston Churchill-themed pen, complete with a piece of his personal cigar, of you don’t use it sign your checks and letters? A lot of things you collect can never be used; stamps, for example. If you use your stamp collection for their intended purpose, your collection shrinks. But when you use your pen collection, they just become more valuable. Pens have long been a symbol of creativity, and the saying “the pen is mightier than the sword,” is not just an old adage. They are signets of wisdom and sophistication. Krone pens embody not only their specific theme, but also hark back to the glory days of writing, when each letter, word, and sentence was crafted by hand. In tribute to that, every single pen is crafted by hand, just the way they were a century ago. It is not just the bit of Winston Churchill’s cigar or a piece of a tree planted by William Shakespeare that makes these pens great, it is the craftsmanship and versatility. So come on over to the Executive Essentials online pen catalog and see if we have something in the Krone line for you or a friend.